← Are Your Sleeping Habits Preventing Maximum Muscle Growth? If your goals, ego or business required you to be in great shape, you’d already be lifting weights regularly. If that’s not the case, why not start weightlifting for the longevity and health benefits? After all, don’t you OWE that to the people you love? One of the most powerful reasons preventing people from hitting the gym and lifting weights regularly is that they simply aren’t emotionally involved in their health and fitness. While they’ll tell you they know they should be lifting weights and doing cardio, they’ll excuse their lack of exercise and poor body condition by saying they don’t have time to hit the gym often. Weightlifting & Cardio can give you a happier, healthier and longer life… So who will YOU stay in shape for? First, you already know that these people want you to be healthy. They don’t want to see you in pain or feeling sick. And unless you’re in a very bad relationship they want you to be happy, self-confident and looking your best, right? Weightlifting not only builds muscles – it strengthens your whole system and your immune system, and helps you ward off the negative effects of daily stress. It can also help you burn off bodyfat, making everything you do each day easier on your heart. And what about you? Don’t you want as many happy and healthy years as possible with those people you love? And don’t some of them count on you – for love, friendship, maybe even support? Chances are you don’t want to check out early and leave them stranded, either. In an article that Marc Ransford published on the Ball State University website, the Director of the Human Performance Laboratory, Dr. Scott Trappe is quoted as saying that a person’s Maximum Oxygen Uptake (VO2 Max) is “a better predictor of mortality than many better-known cardiovascular risk factors”. The article goes on to discuss the results of a study of life-long endurance athletes who are active in cross-country skiing and/or cardio exercise – a study of men in their 80’s and 90’s whose VO2 Max was found to be the same as untrained men 40 – 50 years younger! “Based upon the VO2max findings, the lifelong exercisers have a 50 percent lower all-cause mortality risk compared to the untrained men” says Trappe. So weightlifting and cardio exercise can not only make you stronger, healthier and happier, it can also help you to live that way longer – but only if you get started and keep at it. 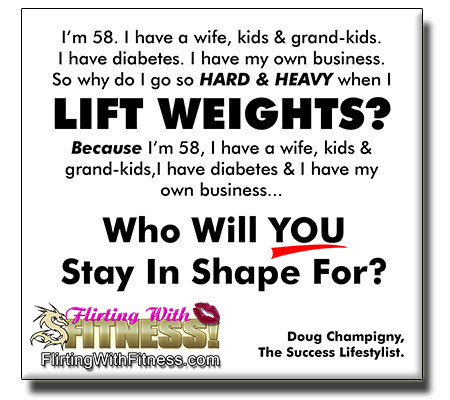 So now the only question is who will YOU stay in shape for? 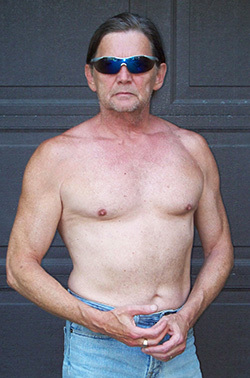 This entry was posted in Healthy Longevity and tagged cardio, exercise, fitness, health, lifting weights, longevity, VO2 Max, weightlifting. Bookmark the permalink.